Carmen Posadas was born in Montevideo (Uruguay), in 1953, and lived there until she was twelve. In 1965 she moved to Madrid with her family, after living in Moscow, Buenos Aires and London, where her father was ambassador. She has published more than 15 books for children, stories and essays, and has contributed to a number of scripts for TV & movies. In 1996 she published her first novel, CINCO MOSCAS AZULES (The Last Resort) which was one of the most surprising and successful books of the year. 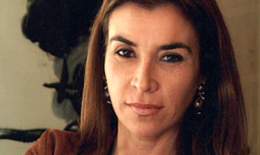 Her second novel, PEQUEÑAS INFAMIAS (Little Indiscretions), won the 1998 Planeta Prize. She is also the author of LA BELLA OTERO (now turned intro a movie), EL BUEN SIRIVIENTE and JUEGOS DE NIÑOS (2006). Her work has been translated into 23 languages so far and in 2003, Newsweek Magazine pointed her out as one of the most outstanding writers of her generation.